Great Impressions® 2.0 walk-off mats promote safety and are designed to complement any office decor. A UniFirst floor mat rental program featuring Great Impressions® 2.0 walk-off mats effectively reduces your overall cleaning time and expense, while safeguarding visitors against slippery floors. Constructed with décor enhancing high-density nylon tufts that wipe shoes clean, these mats are actually attractive carpets that can trap and hold up to 15 pounds of unwanted dirt and up to a full gallon of water per square yard. 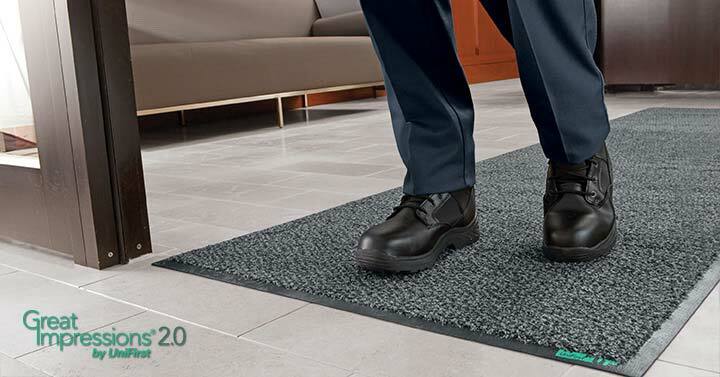 Designed to complement a wide range of office décors, floor mats serviced by a UniFirst Rental Program provide for a cleaner, safer workplace. Great Impressions® 2.0 entrance mats are professional grade commercial floor mats, available only through a UniFirst Facility Services Program. All Great Impressions® 2.0 mats are certified as “high traction” by the National Floor Safety Institute (NFSI). With regularly scheduled entrance mat services from UniFirst, your soiled entrance mats are picked up for professional laundering and replaced with clean, fully functional ones. UniFirst carpet floor mats are available in a variety of colors and sizes to complement any décor. We also offer complete UniFirst floor mat services for scraper mats, logo mats, “wet area” mats, and anti-fatigue mats.